One of the most common themes among all the presidential inaugural speeches is hope; mixed with an uplifting message on the power of God and prayer and a brighter tomorrow. Barack Obama’s speech will probably feature his trademark “hope” but he may also issue a real challenge of responsibility, public service and sacrifice. President-elect Barack Obama’s inaugural address is one of the most anticipated speeches…. 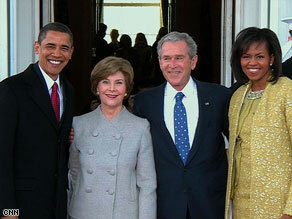 The Obamas met with the Bushes at the White House on Tuesday after a morning church service. You are currently browsing the archives for the divisions category.